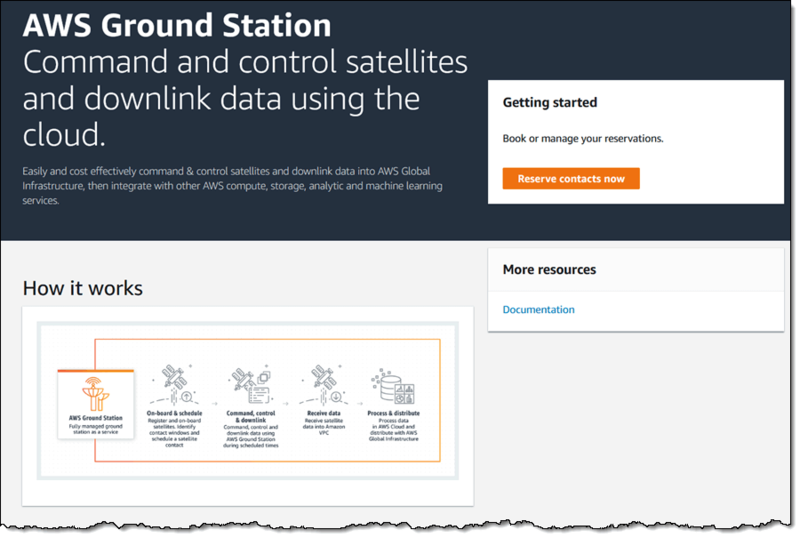 Over on the AWS blog Jeff Barr has blogged about Amazon's new rentable ground station system called "AWS Ground Station". AWS, or Amazon Web Services is the server farm division of Amazon. They allow customers to rent out server capability on demand. In a similar sense, AWS Ground Station is aiming to allow customers to rent out satellite ground stations on demand. Launching low cost micro/nano satellites has become very affordable in recent years and it's now common to see high schools, colleges, organizations and hobbyists designing, fabricating and launching their own satellites. Once launched, a ground station is required to receive the satellite's radio transmission as it passes over. Most low cost satellite owners will not have the budget to deploy ground stations all around the world for continuous monitoring of the satellite. This is where AWS Ground Station can take over, allowing a ground station on the other side of the world to be rented temporarily during a pass. Currently the service is just starting, and only has 2 ground stations, but by 2019 they hope to have a total of 12. More information available on the official AWS Ground Station website. Alternatively, there are other free open source services that could be utilized such as SATNOGS. SATNOGs relies on volunteer ground stations running antenna rotators that can be built with a 3D printer, some low cost motors and electronics, and an RTL-SDR. The antenna rotator carries a Yagi antenna and will automatically track, receive and upload satellite data to the internet for the public to access. Thanks to Alex for submitting news about his new SDR# plugin called "SDRSharp.GpredictConnector". This plugin allows SDR# to interface with GPredict which is a tool used for tracking the orbit of satellites. Just like with the DDE Tracking plugin and the Orbitron satellite tracking program this plugin could be used to automatically tune SDR# to the frequency of a passing satellite using GPredict. It should also be able to compensate for any doppler shift frequency offset. To use with SDR# simply download the zip file and move the .dll file into the SDR# folder. Then add the 'magicline' to the plugins.xml file using a text editor. In GPredict you can then add a radio interface from the preferences, and then use the 'Radio Connect' interface to connect to the plugin. The Radio Society of Great Britain (RSGB) and AMSAT-UK recently presented a number of talks at their latest convention held in October of this year. Some of the talks are SDR related and are interesting for those interested in satellite reception. A couple of interesting SDR related talks are presented below, and the rest of the talks can be accessed on their YouTube page. In this talk Alex Csete (Oz9AEC) who is the programmer behind the popular GQRX software that is often used with RTL-SDRs discusses his latest work and some of his experiences with writing software for SDRs. In this talk Pierros Papadeas who is the founder of the Libre Space Foundation discusses their SatNOGS project. SatNOGS is a project that uses RTL-SDRs in custom 3D printed home made satellite tracking ground stations. It aims to enable easy access to live satellite data online by significantly increasing ground station coverage. Over on Twitter Denis (@uhfsatcom) has recently been teasing us with photos of his 16 dongle RTL-SDR V3 setup. The system looks like it's designed to be a satcom band WebSDR receiver. The satcom band is around 240 - 270 MHz and mostly consists of various military satellites that act as simple repeaters which are often hijacked by pirates. WebSDR is a piece of software that allows for online web streaming of SDR radios. Users from all over the world can listen in if made public. Denis has also uploaded a short video showing a test of 8 dongles running and receiving the satcom band on his WebSDR system. We look forward to hearing more updates on this project! Last week we posted about KD0CQ’s interest check on his ready to go modded SUP-2400 downconverter. Interest was strong so the unit is now available for sale on a store he’s just set up at RXTXDX.com. The ready to go unit costs $25 USD including a 9V battery plug and F->SMA or MCX adapter. 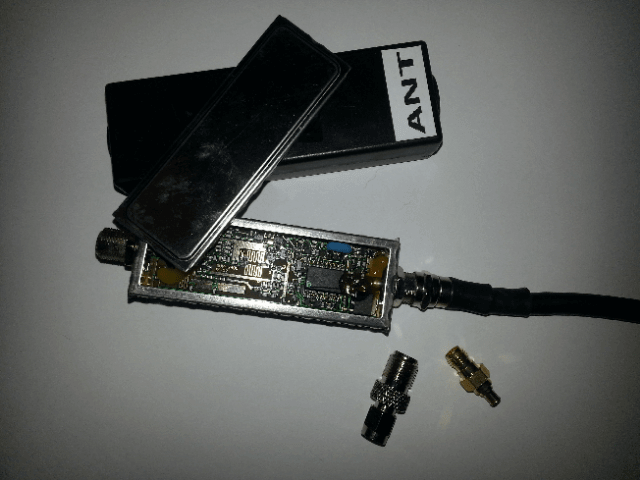 Last year KD0CQ discovered that the SUP-2400 is a cheap $5 – $10 DirecTV (US satellite TV) module which can be hand modded into a downconverter for the RTL-SDR. A downconverter allows you to listen to frequencies above the maximum frequency range of the RTL-SDR by converting frequencies down into a range receivable by the RTL-SDR (or of course any other SDR). The modified SUP-2400 allows to you listen up to just over 4 GHz. The SUP-2400 modification is moderately involved and requires soldering and desoldering SMD pieces, so this product is great for anyone who just wants a cheap and low cost downconverter which is ready to go. And at $25 USD it’s still very good value. Shipping within the USA is $7.75, and internationally it is about $13.50. 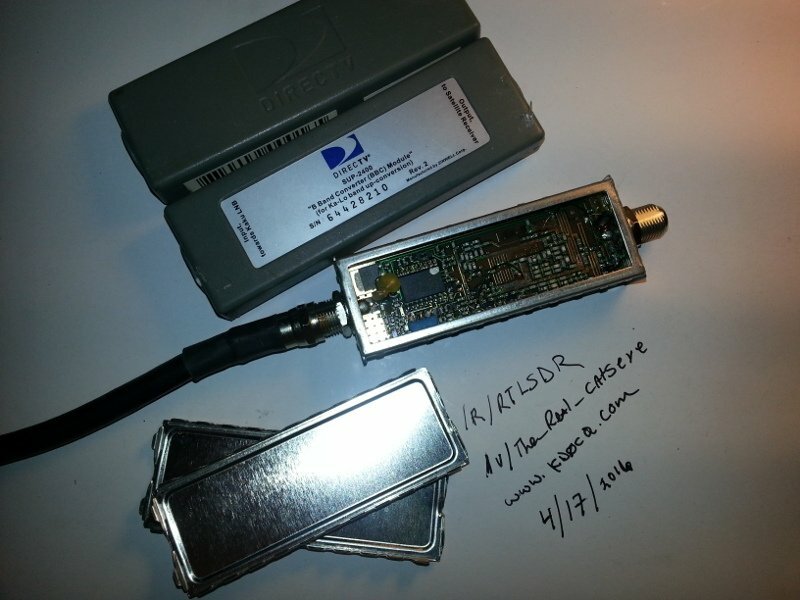 Back in 2016 KD0CQ discovered that a $5 DirectTV device with model name SUP-2400 could be used as a downconverter with an RTL-SDR for receiving frequencies of up to 4.5 GHz. A downconverter is a device that converts high frequencies such as 4.5 GHz down into a frequency actually receivable by the RTL-SDR. The SUP-2400 is able to be modified into a useful downconverter by opening it up and manually removing some mixing harmonic filters. In his latest post KD0CQ shows how you could combine four modified SUP-2400 downconverters to create a quarduple conversion mixer which allows you to receive up to 10 GHz. The post goes into the mixing math and practicalities of this idea. KD0CQ writes that some amplification will most likely be required to push the signal through, and in the past he’s managed to receive up to 7.5 GHz. The SUP-2400 DirecTV device that can be converted into a downconverter. Mario Filippi, a regular contributor to our blog and to the SDR community recently wrote in with an article showing how he built an S-Band (2 – 4 GHz) antenna for use with the HackRF. Of course the antenna can be used with any other SDR that can receive in this range, or with an RTL-SDR and downconverter. We post his article below. Ever since purchasing a HackRF One, which receives from 1 MHz – 6.0 GHz I’ve always wanted to explore the world above 1 Gig, specifically the 2.0 – 2.7 GHz portion of the S-band. This portion of the band is populated with satellite communications, ISM, amateur radio, and wireless networks. A good, homebrew antenna for S-band was needed, so with parts mostly from the junk box, a 2250 MHz S-band right hand circularly polarized omni-directional antenna was built. 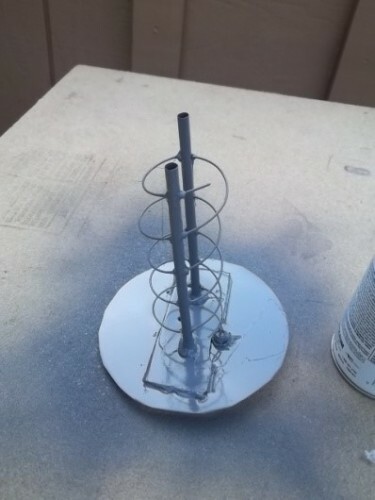 Below is a step by step tutorial on building this antenna. Plans were from UHF-Satcom’s site. Earlier in June YouTube user T3CHNOTURK posted a video demonstrating him receiving signals above the maximum 1.7 GHz range of the RTL-SDR by using a modified SUP-2400 downconverter. Back in April it was discovered by KD0CQ that a $5 DirecTV SUP-2400 circuit could be modified and turned into a downconverter for use with the RTL-SDR. Now T3CHNOTURK has uploaded a new video showing more demonstrations of the RTL-SDR + SUP-2400 combo in action. This time he adds a PGA-103 based LNA to boost the signal strength, which gives him better effective range. In the video he shows reception of a wireless keyboard once again, and then goes on to show him receiving 2.4 GHz analog PAL video using the RTL-SDR program TVSharp. The picture is not particularly clear, but it is a decent demonstration.